Availability: This product is discontinued and no longer available for purchase. For alternatives browse our Badminton Bags department. 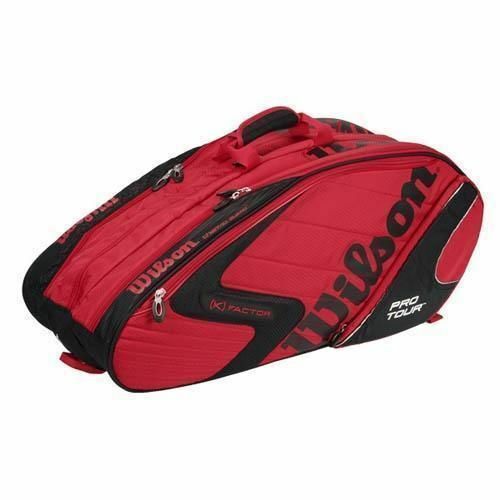 The Wilson [K] Factor Pro Tour Six Racket Thermal - The authentic bag collection carried by the World's top tour professionals including Roger Federer and Justine Henin-Hardenne. This racket bag has patented Thermoguard and MoistureGuard compartments to protect rackets from the elements. Materials: 420D Nylon, 600D PolyesterColours: Red/White/BlackDimensions: 31" x 14" x 11"
for submitting product review about Wilson - [K] Factor Pro Tour Six - Racket Thermal.